Dive into a Disney Princess adventure with Ariel’s underwater playground. Play with Ariel on the seaweed swing while Flounder glides down the big water slide. Don’t forget to search for the treasure- filled chest! 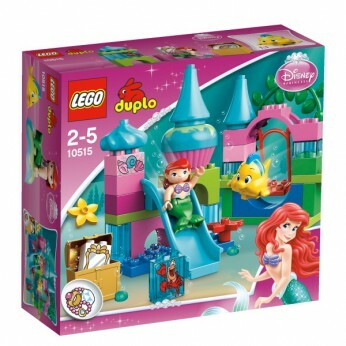 Includes 2 LEGO DUPLO figures: Ariel and Flounder…. This toy costs approximately £19.99 (for the latest and best prices make sure you check our retailer list for the LEGO Duplo Ariels Undersea Castle 10515 above). In our review of LEGO Duplo Ariels Undersea Castle 10515 we classed it as being suitable for ages 6 years, 7 years, 8 years, 9 years, over 10 years but recommend you check the manufacturer specific advice before purchasing.